Yep you heard right. 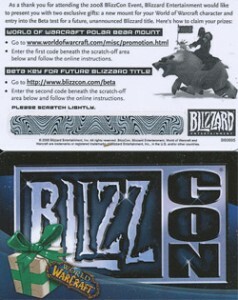 I have an extra beta key from the BlizzCon 2008 card (mount code was used) so I’m giving it out to a lucky listener of LoL! 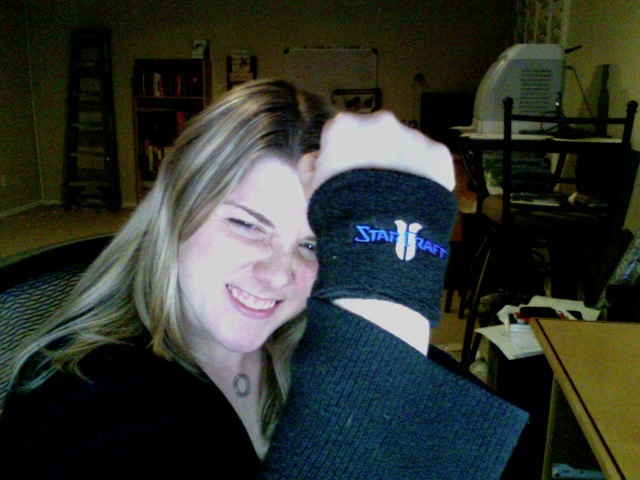 Not to mention some sweet SC 2 sweat bands! So what do you have to do? It’s simple really, just sign up as a fan of Ladies of Leet on Facebook and you’ll be automatically entered. I’ll pick a random fan (using random.org) and will send you the code and sweat bands. You have until March 5th to sign up. Hi. Betas will be given again in a week or so.. untill march blizzard would have every1 that wants beta in beta – Heroes of Newerth example, i had invites all the time, and i knew how they were precious, now i have extra 6. in just two – three months. Perhaps a stupid question, but I’ll still be in the draw if I was listed as fan BEFORE this competition, right? we all are looking forward to march 5th. still, its hard since Blizzard actually stopped time with the beta keys. Anyway, gj on your ideea. Still i was the 1st, i get +points in random roll :P -kidding. nice try ;) If someone wins that doesn’t play SC I’m sure they will make someone they know very very happy. oh I didnt think you were being mean :) I hope it goes to a real SC fan too! i realy realy want a beta code:( iv tried evorything and nothing worked. im broke and cant get 60 bucks to preorder the game to get the key so im all out of luck:( iv played starcraft since i was 7 years old i was born in the year the first game came out.i realy realy want one AND ILL DO ANYTHING FOR IT! Sorry to say we gave this away months ago :( Wishing you luck on your hunt.